We are the largest meeting point in the region, whether it's for meetings, conferences, holidays or weekend stays. Our hotel is located in a large, private park near the centre of Lillehammer. Treat yourself to some luxury in your daily life and enjoy the great amenities of our wellness center while you are with us. We have 15 flexible meeting rooms for 2–1,200 people. Our hotel has 2 restaurants; Salt & Pepper, our à la carte restaurant, and Tre Diktere, our main restaurant. Everyone finds their favourite place at our hotel. Our hotel has a large well-equipped fitness centre measuring 500 sqm with its own yoga room, and together with our indoor and outdoor wellness centre and pool, we have something for everyone. Our location close to the centre makes our hotel the obvious choice. In winter, a ski bus departs from Lillehammer Skysstasjon up to Hafjell every hour, but only one departure morning and return afternoon goes by Scandic Lillehammer Hotel. Please contact the reception for the stopover. Lillehammer is a treasure trove for activities all year round! The opportunities to take part in different activities both in the summer and winter seasons are excellent. If you enjoy culture, sports, well-being, speed and excitement, this is the perfect starting point. Our hotel is close to Maihaugen museum, the Olympic ski jumping arena and the centre of Lillehammer. Enjoy your time at Scandic Lillehammer Hotel by making use of our fantastic wellness centre. Hopefully you'll leave our hotel filled with energy after an enjoyable stay. Our hotel has 2 excellent restaurants; Salt & Pepper is our à la carte restaurant, serving delicious food in calm surroundings, and Tre Diktere is our main restaurant. Our magnificent banquet hall, Weidemann, has chandeliers and windows facing the garden. 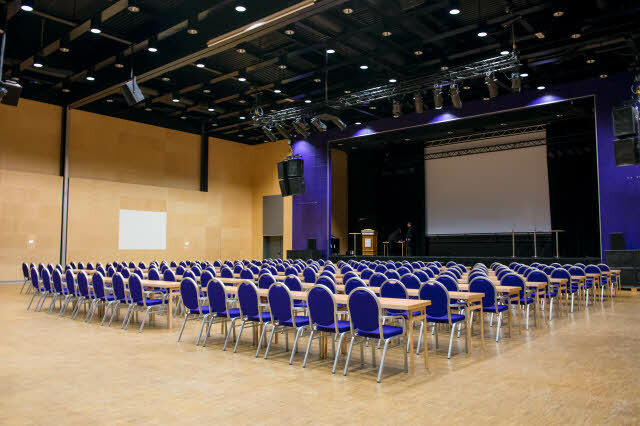 Our largest conference hall is 1,010 sqm, and can accommodate up to 1,200 people in theatre seating. The hall can be divided into 3 separate sections for parallel sessions and separate conferences. The doors towards the adjoining rooms can be opened, creating over 2,000 sqm of space, well suited for exhibitions. Are you between 18-25 years? Hi there, if you're between 18–25 years! Get 25% off your stay at our hotels in Norway. Our breakfast is included in the price. Find your favourite hotel - all days, the year round. Book on our website and save up to 25%. is what you need to book a reward night at our hotel. Click here for more information!